FirstNet was in Albuquerque, New Mexico, last week for the National Association of State EMS Officials’ (NASEMSO) Fall 2016 Meeting. FirstNet Board members Sue Swenson and Kevin McGinnis led a meeting and discussion with the NASEMSO Board of Directors. Kevin also presented alongside outgoing NASEMSO President and PSAC member Paul Patrick during a break out session, focusing their remarks on the FirstNet State Plan process and ensuring that EMS stakeholders are active participants. NASEMSO also considered and approved a resolution of support for FirstNet. On September 27, from 1-2 p.m. 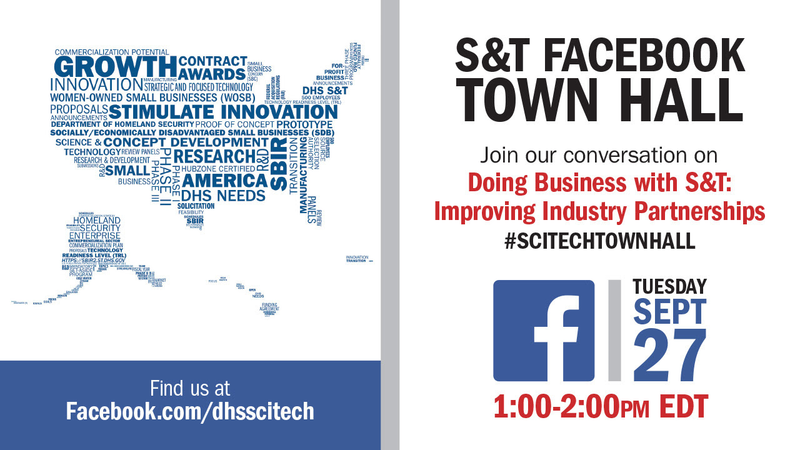 ET, join the DHS S&T Office of Public-Private Partnerships in a Facebook virtual town hall to learn and discuss how S&T collaborates with industry. This virtual town hall is an opportunity for industry to provide S&T with feedback on how we can improve our partnership and engagement efforts to make it easier and more efficient to work with us. You can also follow us at @dhsscitech on Twitter for more ways to connect. Follow this link for more details!